The Nelson and Trafalgar Collection. 35 x 121 cm (14″ x 48″), oils, the original was commissioned for Victory 2005, Available, price upon application. Off Cape Trafalgar, “Victory” at about 11.00 hours leading Nelson’s column into action. 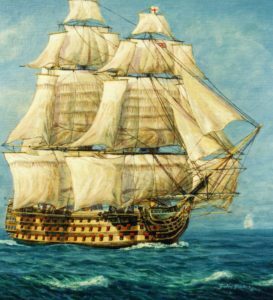 “Nelson’s Column” was painted as one of a series while Gordon Frickers was official artist to HMS Victory, to help raise funds for the restoration of this now unique and famous ship the only one of her type to survive to this day. The painting shows the leading ships of the column. These were “Victory“, “Temeraire“, “Neptune“, “Conqueror“, “Leviathan“, “Britannia“, “Ajax“, “Agamemnon“, “Orion“, “Prince“, “Minotaur” and almost off canvas, “Spartiate“. Also shown in the background are “Africa” re-joining from the North having become detached during the night, the frigates “Euryalus” and “Phoebe” . and as usual the ubiquitous schooner “Pickle“. This painting gives a clue as to why the French and Spanish of the Combined Fleet of Emperor Napoleon Bonaparte were so impressed with the disciplined determination of the British Fleet. Distances the ships are apart, sails set and order of sailing is based on official and eye witness accounts. Never mind making a “pretty picture” to sell, with this painting and others by this artist Gordon Frickers, you also have a reliable historic document. Click on the small image on the left to see Detail from Nelson’s Column. “Victory” at 06.10, as soon as it was light enough to be seen, hoisted signal number 72 (using Admiral Popham’s 1803 Code ) and in accordance with Nelson’s pre-arranged plan known to his captain’s as the Nelson Touch, the British fleet began to turn towards their opponents’ and to form two columns. This painting, one of a unique series produced with the intention of raising funds for H.M.S. Victory. 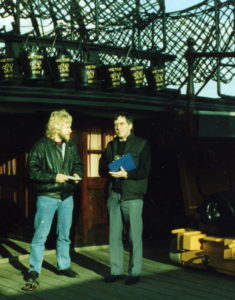 With a letter of authority from her then captain Mike Cheshire, the series resulted from careful studies of the logs and diaries of officers in both fleets, a though reading of the Admiralty Committee Report of 1913 and numerous other sources including consultations with Peter Goodwin the ship’s curator and Colin White (later Dr Colin White), of the Royal Naval Museum, Portsmouth. I visited Cape Trafalgar so stood upon the beach and ‘felt’. He was also researched Cadiz with the help of Cadiz University and San Sebastian naval base (as a guest of the Spanish Navy) and most of all “Victory” at Portsmouth. I also built a perspective model of the “Victory“. During the slow approach, it is just possible there were a few by mid-morning but no more than that. 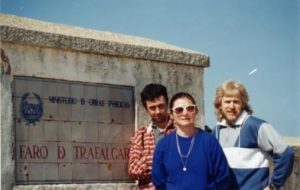 A careful reading of the ships logs and the 2 books on the weather at the battle of Trafalgar written by Spanish authors after the battle indicate the light breeze progressively died and the cannon fire seemed to stifled it still more. You may notice the “white horses” in this painting? Thus if you see a painting of the ships engaged, with white horses riding the waves, dismiss it as fanciful! Admiral Horatio Nelson had during the preceding days using Popham’s new code and the night before in particular, in response to pre-arranged coloured rocket and light signals from his frigates, maneuvered the British Fleet into an advantageous position to windward of his opponents. At dawn the British fleet was up wind of the Combined Fleet and in a position to cut off any attempt by the combined fleet to return to Cadiz. Admiral Pierre Villeneuve was well aware of this. Admiral Pierre Villeneuve, had previously guessed Nelson’s plan of attack, carefully planned his counter measures with his captains and had his own reasons for seeking battle. Several of Villeneuve’s ships had chased the British frigates, seen the British Fleet the day before and reported to Villeneuve’s flagship “Bucentaure“. What went wrong for Villeneuve, the Combined Fleet, and why is a subject for another script. Much has been written about Nelson’s tactics and genius and undoubtedly he was a very remarkable commander. 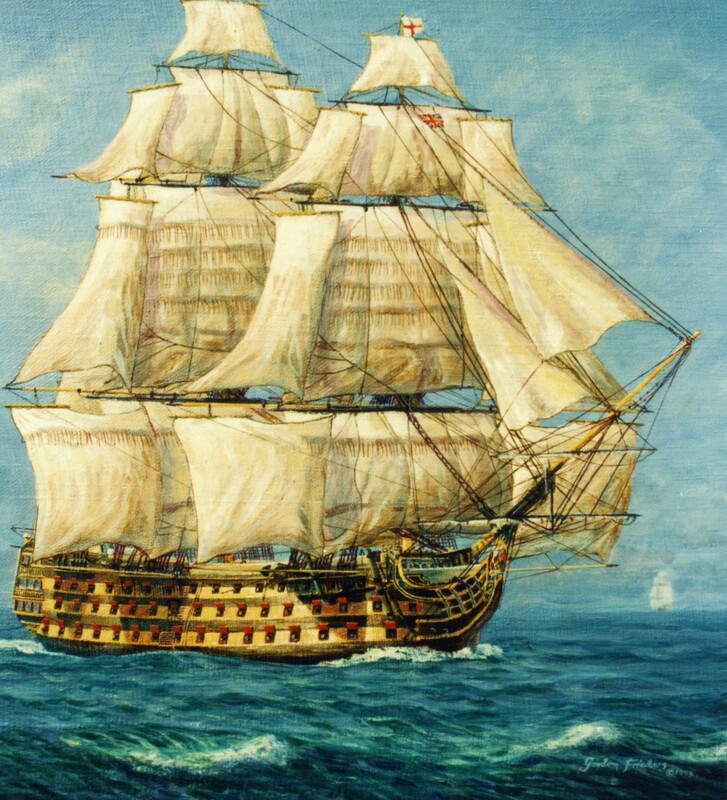 It is rarely acknowledged though that Nelson was well read and with slight modifications was using at the Battle of Trafalgar a tactic first known to have been used by the British during the Commonwealth period in Anglo Dutch wars. For a brilliant account of that campaign read A Distant Storm: The Four Days Battle 1666, by F.L. Fox, ISBN 0-948864-29-X and see Zeven Provincien, elements of the Dutch Fleet. Today the ship HMS Victory is preserved less splendidly , truly a world heritage artefact, dry docked at Portsmouth as part of the Historic Dockyard display. 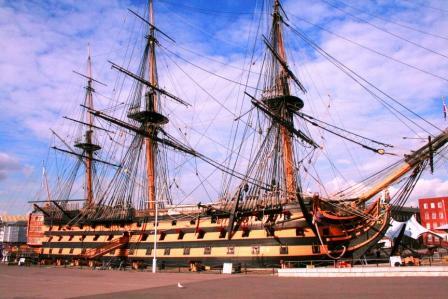 Open to the public if you visit I guarantee you will never forget your day at the Historic Dockyard. A painting from that unrepeatable period of my life when I was given access to archives normally closed even to scholars, this series of paintings have helped illustrate many books. I am honoured to have become a small part of the bigger Nelson story. This painting “Nelson’s Column” is owned by Victory 2005 Ltd of London, it is available for a reasonable offer.